Alone or with your beloved one, come and enjoy Om Yoga Casablancas All Year Round Yoga Retreat at their peaceful studio in beautiful Casablanca. 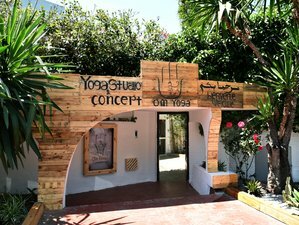 At Om Yoga Casablanca, they will make your dream vacation come true. So come and take part in one of their many yoga packages, where you can recharge your body, uplift your mind, and enlighten your soul with yoga and meditation in Morocco. On this Moroccan yoga retreat, eat delectable organic meals and take top of the world yoga classes. People have benefited from their stay and have returned to their homes with the sensation of feeling replenished and serene. Please note that TRX, Wall, Bungee and Aerial yoga need to be scheduled in advance due to limited space. Bikram is a wonderful 90-minute workout that improves fitness, flexibility and balance as well as increasing mental alertness and concentration. Each session consists of 26 postures and 2 breathing exercises practiced in a heated room. Heat improves circulation, helps eliminate toxins and reduces the risk of injury during stretching. Though it can be challenging it is open to students of all ages and levels. The Bikram method was created to help people overcome the increasing stress of modern life and was designed to prevent illness, injury but assist with weight loss and reduce the effects of aging. Hatha yoga is based on the postural practice of asanas and pranayama breathing, and is open to students of all levels. It allows beginners to take the time to learn the basics at their own pace, and can consist of both static postures and dynamic flows, such as the popular sun and moon salutations. The emphasis in Hatha yoga is on breathing and the fusion of mind and body. Power yoga is a series of dynamic movements designed to develop muscle strength, flexibility and breath control. Closely modeled on the Ashtanga method, Power Yoga is a vigorous fitness- based approach to the Vinyasa style. Regular practice ensures many benefits, namely the relaxation of the body and the development of balance. Vinyasa yoga consists of various sequences of postures. Postures are combined to create a dynamic flow, with focus placed on synchronizing the movement and breathing. Vinyasa develops strength and flexibility, and provides a considerable cardiovascular benefit and increased fitness level to all practitioners. Is a gentle form of yoga that is suitable for everyone and is practiced mostly on the floor. It consists of twenty postures each held for up to several minutes, during which time the focus is on breathing and meditation. Is a method of exercising that lengthens and stretches all the major muscle groups in the body in a balanced fashion. All exercises are performed in harmony with breathing, concentration and movement control. The barre au sol uses the daily exercises of the dancers by using the barre for warm-ups before moving to the middle which uses traditional ballet techniques. Upon practicing the barre au sol, the body has the advantage of support surfaces and gravity plays differently on the force exerted on the muscles and joints. The position of sitting or lying down allows the students to focus attention on the alignment of the body and concentrate on parts that are difficult when done standing up. Ashtanga yoga is a system of yoga transmitted to the modern world by Sri K. Pattabhi Jois (1915-2009). This method of yoga involves synchronizing the breath with a progressive series of postures process producing intense internal heat and a profuse, purifying sweat that detoxifies muscles and organs. The result is improved circulation, a light and strong body, and a calm mind. Yoga nidra or "yogi sleep" is a sleep-like state which yogis report to experience during their meditations. Yoga nidra, lucid sleeping is nidraong the deepest possible states of relaxation while still maintaining full consciousness. Fit Flow Fly was developed from Ashtanga yoga and made famous by Dice and Briohny Smith-Klein. Also called Energy Yoga, Fit Flow Fly is a safe way to prepare your body for the challenge of inversions and arm balancing postures. Aerial Yoga combines traditional mat yoga with postures suspended in soft fabric hammocks. With the help of gravity and the hammocks, we can playfully explore floating, fluid movements and create space in our bodies without compressing our joints and spine. The feeling in the body is exquisite. The very name Casablanca recalls the romance and drama of the classic Hollywood film that immortalized Moroccos most famous city. But the real romance of Casablanca lies in its beautiful beaches and stunning architecture, the burgeoning art and fashion industry and the cosmopolitan and European lifestyle readily on offer. Casablanca is the countrys economic and cultural capital and represents Moroccos constant evolution in the modern world. Om Yogas cuisine takes the folklore and tasty ingredients of the traditional Moroccan recipes and integrates them with an original accent to a healthy diet. A menu of guests will find unique and delicious. The meals are healthy gourmet style and include vegetarian food, fresh fish, seafood, and on occasion chicken. Restaurants and bars including the famous Ricks Caf (from the movie Casablanca) and La Scalla. The Hassan II Mosque; the second large mosque in the world and an architectural and cultural wonder that is not to be missed! From Casablanca's airport, the retreat is located at 2, Rue Du Golfe Du Comores, Casablanca, Morocco. The easiest and most convenient way to travel is by taxi. Taxis are cheap and readily available. Airport: Mohammed V International Airport Airport transfer included: Mohammed V International Airport No additional charges. You can request this in the next step.